Edinburgh is home to the world’s biggest annual multi-arts event which has been running consecutively since its inception in 1947. 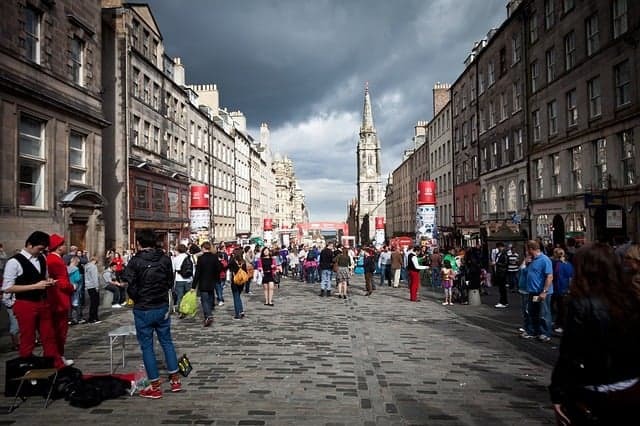 Originally created as an alternative to the already-popular Edinburgh International Festival, the Fringe has grown in strength each year to the point where the annual figures can only be described as astonishing. Over 25 days there is an average of more than 50,000 performances of nearly 2500 different shows, held in 300 different venues which are frequented by nearly half a million visitors. An incredible 2.7 million tickets are purchased (as of 2017) with the total ticket sales amounting to a whopping £4.3 million! The Fringe is an absolute riot of colour and sound and you’d have to have had a fun-bypass to not enjoy yourself there. 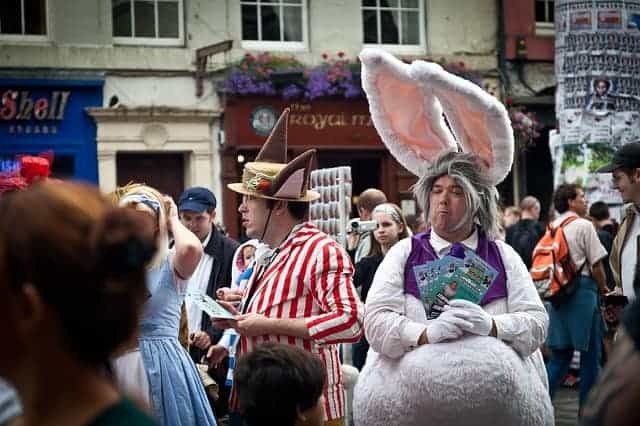 A combination of street artists and paid venues create an absolutely electric atmosphere and you’ll find all age groups from 8 to 80 enjoying the shows on offer. 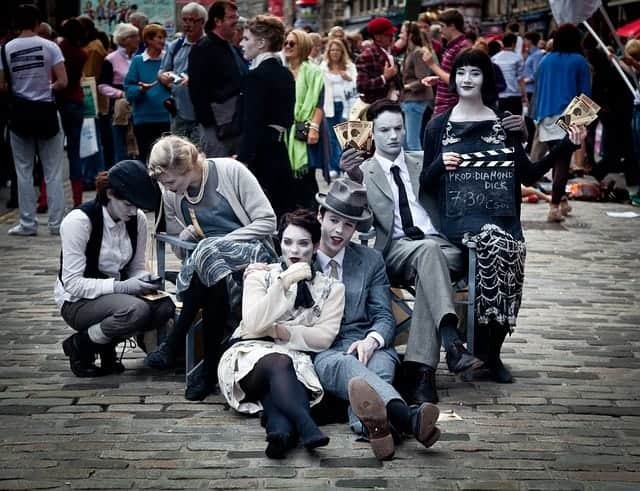 One thing to be aware of if you’ve never been before is that some of the shows are a bit hit-or-miss so you never know what the quality is going to be like until you’re actually sat in the audience, but to my mind it’s all part of the fun, and watching the emerging talent is what makes The Fringe such a special event. 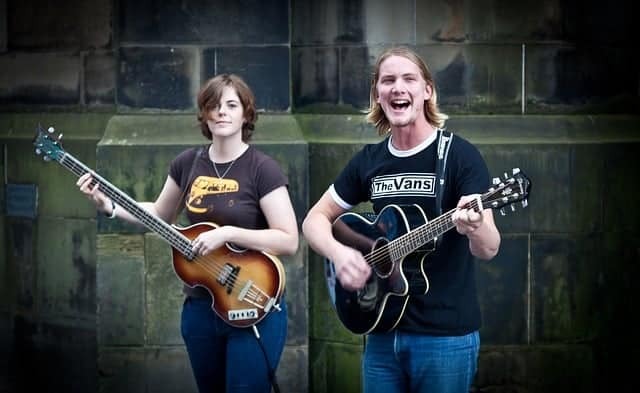 While there have been some complaints in recent years that the festival is becoming too commercial with rapidly skyrocketing ticket prices, there’s been a recent movement by many performers to provide free shows such as those held along the main streets of The Royal Mile, as well as ‘pay what you want’ shows where attendees are simply asked to make a donation of their choice at the end of the performance. One of the reasons that the festival continues to be so popular is that unlike many similar events, there’s no selection committee to decide which acts can or can’t be shown, so anyone with any type of artistic skill can participate in either paid or unpaid events. This has led to many performers getting their first big break in Edinburgh before moving on to nationwide stardom. 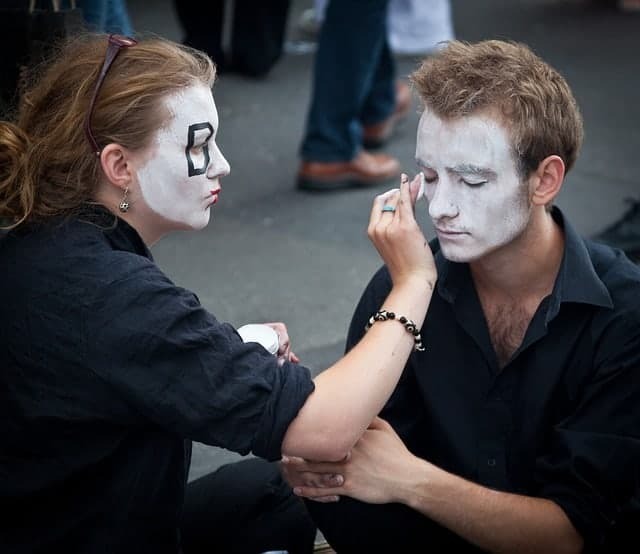 Art in all its forms can be found at the event, with categories including theatre, comedy, dance, circus, cabaret, music, opera and spoken word performed by a variety of artists from complete amateur beginners to world-famous professionals. Notable performers who had their big breaks at the Edinburgh Fringe include Rowan Atkinson, Eddie Izzard, Tim Minchin and Billy Connolly, while big stars like Ricky Gervais, Mike Myers and Steve Coogan have also had their time on the stage there. 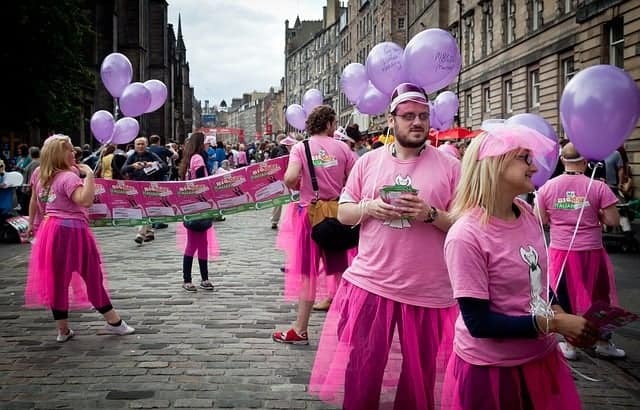 Although events are held all over the city during Fringe month, there are four main venues which are big enough to hold the thousands of visitors who descend on the city in August. These are the Assembly Hall on The Mound, The Gilded Baloon in Bristo Square, The Pleasance located at both The Pleasance and Bristo Square, and Underbelly which is situated on both George Square and in The Cowgate. But not all acts are held in traditional venues, and there have been performances held in swimming pools, public toilets and even in the performers own homes! 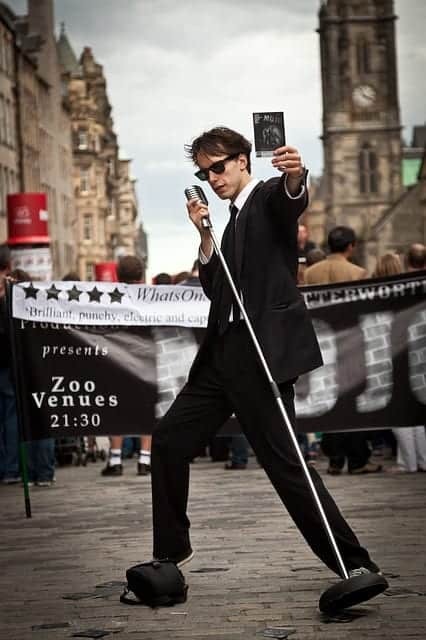 Veteran Fringe-goers are wise enough to check out the EdFringe website before leaving home to decide which shows to see and where to see them. Top-Tip: If you’re in Edinburgh check out the Half-Price Hut outside the National Gallery before you buy your ticket as you’ll often find 2-for-1 shows when they’re trying to drum up a bigger audience. With some tickets costing around £20 per person it’s one of the few chances you’ll get to shave a few quid off the cost of attending the festival. Edinburgh, UK. Performances are held at various venues throughout the city. Contact each venue for address details. 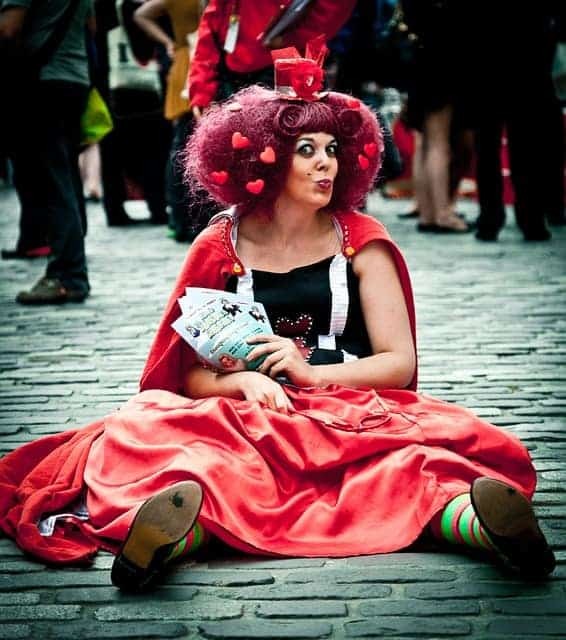 The Edinburgh Fringe Festival is held for around 25 days beginning in early August, but individual performance price and times vary. Contact each venue for further details.